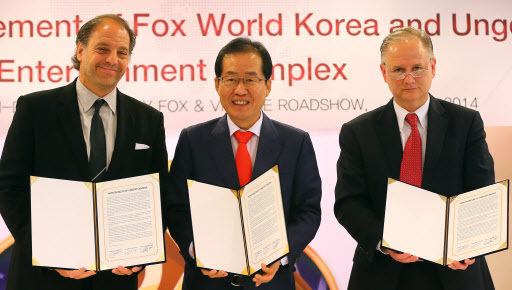 The two companies and the South Gyeongsang Province government signed a tripartite memorandum of understanding on Wednesday at the Foreign Press Center Korea. The $3.5 billion investment project involves the construction of a mega sized leisure complex within the Busan-Jinhae Free Economic Zone in Changwon, South Gyeongsang Province. Though efforts have been made in the past to build theme parks here, jointly with global players such as Universal Studios or Paramount, none have so far succeeded. “Jinhae, however, is different from past cases as the region is part of the FEZ,” said South Gyeongsang Gov. Hong Joon-pyo. The theme park will not only vitalize the regional economy but also boost Korea’s attractiveness as a major tourist spot in Asia, creating an employment effect for 10,000 people and a direct economic effect of 5 trillion won, according to the governor.